HEIScope MZ Micro Zoom Microscope Objective Lens are semi-plan achromatic design is used, which also can be used with infinite distance metallurgical phase or Biological Microscopes to form images. A HEI Scope MZ Micro Zoom Microscope Objective Lens may be configured according to the user's need (the working distance and magnification is adjustable in the given range). 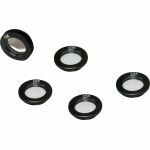 Purchase a HEIScope MZ Series Objective Lens sold by Howard Electronics Today!